Deep beneath the earth the seeds are sleeping, storing energy to emerge in Spring. Sybille van Olfers has enchanted several generations with her exquisite illustrations and story of The Root Children. 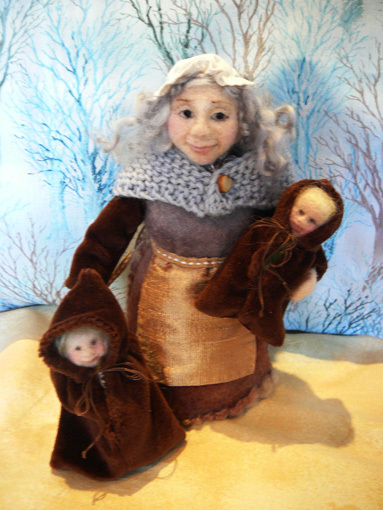 This classic children’s story inspired these figures of Mother Earth and two of her charges. and colour our hearts with joy. Sybille’s Mother Earth is older, more like a wise and nurturing grandmother, which also came through in this rendition. She is much like the Teutonic Earthmother, Mother Holle. Like the energy of Winter that slows and draws one down deep to reflect, this group took some time to complete. It was a result of quiet and steady contemplation; quite different to the usual intense excitement that accompanies many other creative ventures. This Earth Mother generated calm as well as a slower and steadier progress. In this piece I really tried to bring in a mix of textures and natural elements. Her face is needlesculpted from merino and corriedale fibres. Her hair made from curly mohair locks. Her eyes are small obsidian crystals. Over the wool core that forms her body is a hand- stitched dress of wool felt. The handknitted shawl is fastened with a little heartshaped shell button. Gnobbly, woollen yarn roots twine around her skirt . Her apron is made from silk. As this group neared completion in popped another Winter entity, enticing and wanting to emerge. It is hard to maintain concentration when so many new ideas present but perhaps the Good Mother had a powerful influence, and kept the task at hand as the focus. It is often all too easy to start up another thing and loose impetus. Finishing and not allowing distraction has been quite a milestone. Now this new little being is on the way I am quite excited to see how this character takes shape. I was going to tell you who it is but then that would spoil the surprise. Stunning Christina! She’s just so beautiful and benevolent.